License: 60% off for the celebration of Oxford Dictionaries joining in. Got stuck in a totally unfamiliar language environment? When you could not manually input to search for results, even the most powerful electronic dictionaries would be just useless! CamDictionary – your personal translator anytime and anywhere! CamDictionary is a professional instant translator application. ---- Together with the world-famous publisher Collins, now we’re glad to bring multiple Collins dictionaries to you, allowing you to get the most authoritative word explanations. ---- No need to take photos, no need to wait. Focus words in the camera viewfinder, and the translation results will be just there. 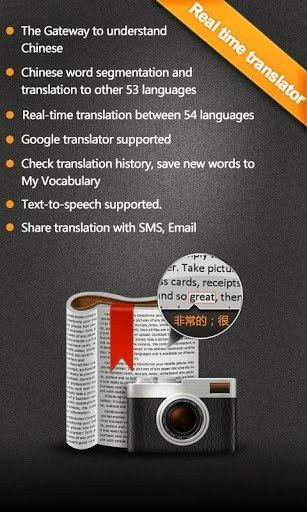 ---- Get the translation results for full sentences easily and conveniently. ---- CamDictionary supports translation between 36 languages. ---- Get results from local dictionaries when no network is available. The application has built-in Chinese-English Dictionary and English-Chinese Dictionary. ---- Listen to pronunciations of translated text by native speakers. ---- Load pictures, and select the entire line for recognition and translation. ---- Just select a picture, and CamDictionary will automatically recognize and translate the text on it. ---- CamDictionary can now show Pinyin for Chinese characters. Learn Chinese more easily from now on. 1. CamDictionary is able to recognize up to 16 languages, including Simplified Chinese, Traditional Chinese, English, Korean, Japanese, French, Spanish, Portuguese, German, Italian, Dutch, Swedish, Finnish, Danish, Norwegian, Hungarian and etc. 2. CamDictionary supports up to 18 languages for pronunciation, including English, Spanish, Simplified Chinese, Traditional Chinese, Japanese, Korean, French, German, Russian, Portuguese, Catalan, Danish, Dutch, Finnish, Italian, Norwegian, Polish, and Swedish. 1. Text-to-Speech is not available in free version. 2. Free version contains advertisements. 3. Free version has the “Trial” mark.